1. For the cupcakes: preheat the oven to 180C/160C fan/gas 4. In a mixer, combine the butter and sugar. Once this is fluffy, add 4 eggs one by one. 2. Add half of the peanut butter to your batter and mix well. Add the flour and once this has all mixed up, spoon into cupcake cases and bake for 18 minutes. 3. Once they are firm but springy to the touch, remove from the oven and allow to cool. 4. For the frosting: in a bowl, combine the butter with the icing sugar and once this has mixed well and become fluffy, add the remaining half of the peanut butter. 5. Blend for 3 minutes and then either spoon onto the cooled sponges or pipe with a nozzle and piping bag. Finish off with a sprinkle of chopped peanuts. 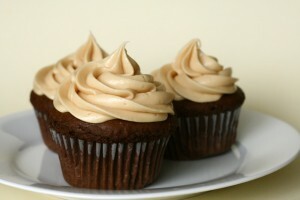 This entry was posted on at and is filed under Peanut Butter Cupcakes. You can follow any responses to this entry through the RSS 2.0 feed. Responses are currently closed, but you can trackback from your own site.